Apo Island is a peaceful, postcard-perfect island paradise. It has a rustic town, uniquely formed sea cliffs, an expansive snorkeling area, white-sand shores, and tree-covered hills. But like many of the amazingly beautiful places we’ve been around the country, its true beauty is hidden. The real gem of Apo Island lies beneath the blue waves, an array of magnificent dive sites whose beauty almost defy imagination. Our anniversary culminated with an excellent dive in one of these dive sites. As usual in most of our sojourns, we woke up early to see the ethereal orange glow of a beautiful sunrise. There is nothing more energizing than seeing the sun slowly rise up from the horizon. 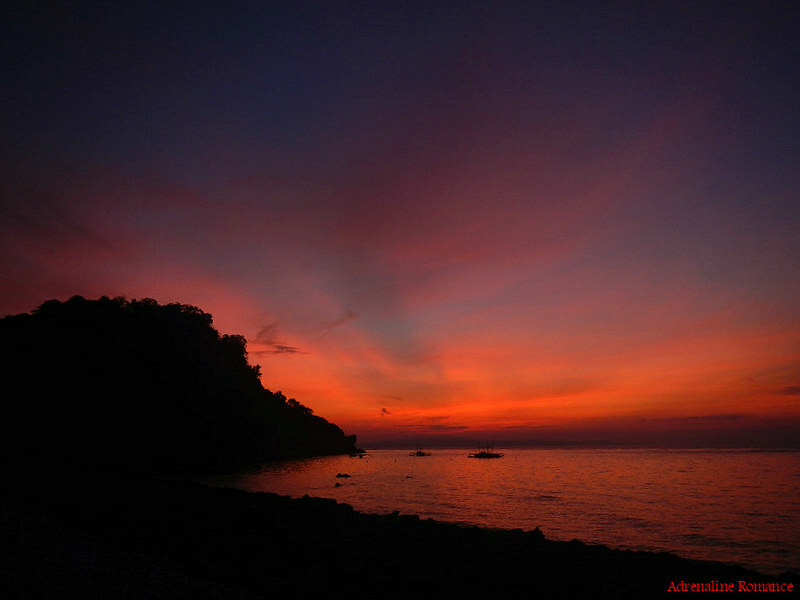 Apo Island’s sunrise happens at the east side of the island where the main and largest sanctuary is located. Unfortunately, the sanctuary is temporarily closed due to ongoing rehabilitation efforts of the damage caused by Typhoon Sendong (Tropical Storm Washi), which wrecked central-southern Philippines last 2011. It has been 4 years since the storm, but the reef hasn’t fully recovered yet. Upon returning to our homestay, we passed by this nice saltwater lagoon. This is a perfect place for kayaking and stand-up paddling, but that is probably prohibited here. 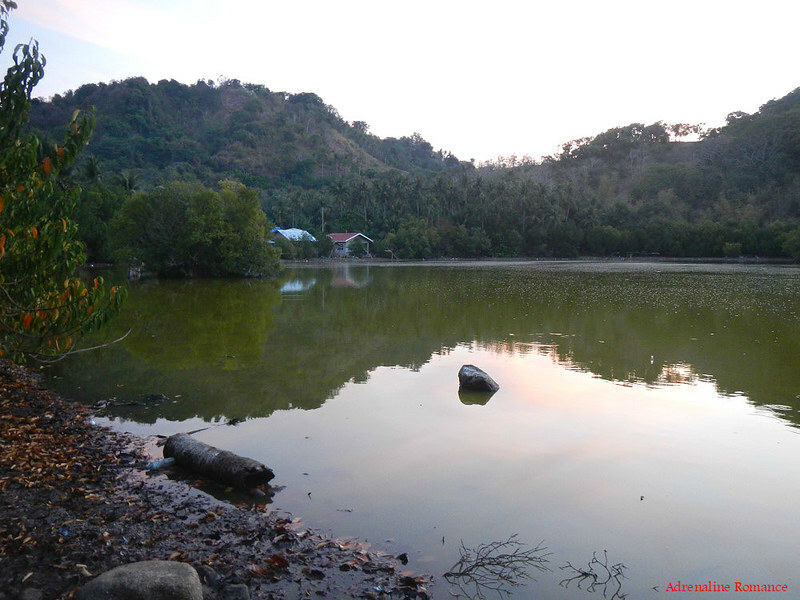 We think this lagoon is part of the protected area. 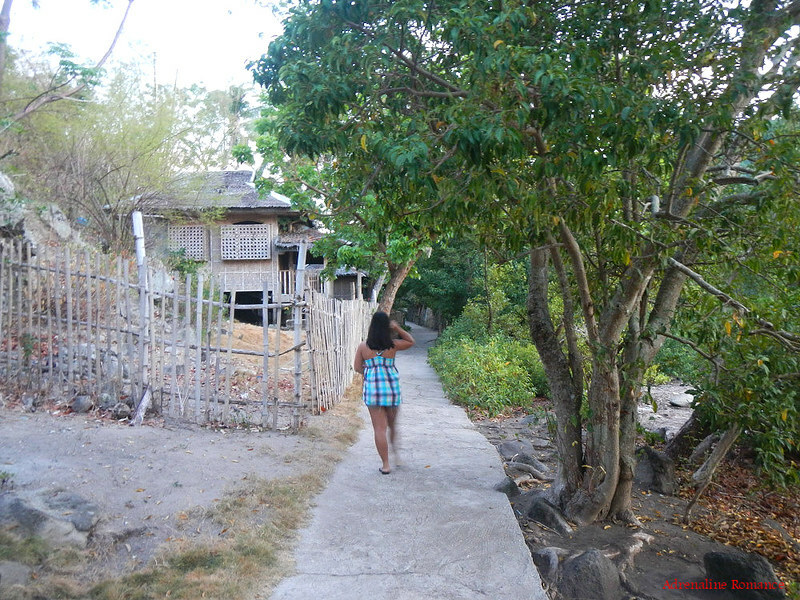 We were up so early that, aside from a few fishermen, we were the only ones walking around the town’s pathways. We planned to dive early to take advantage of the clear weather, so we held off breakfast (and Sweetie doesn’t like to dive with a full stomach). Our divemaster and guide Mac-mac gave us the usual briefing. 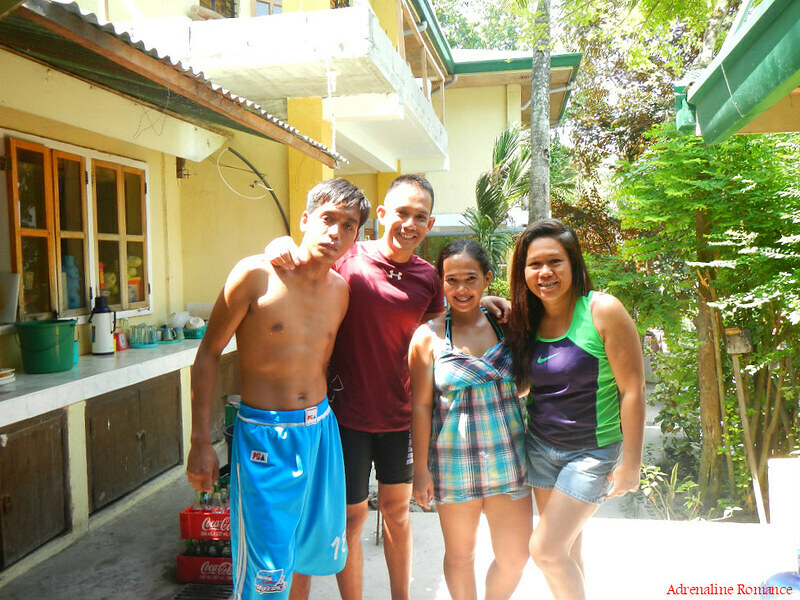 We were to dive in a site called Chapel, which is ideal for beginners since there’s no strong current there. 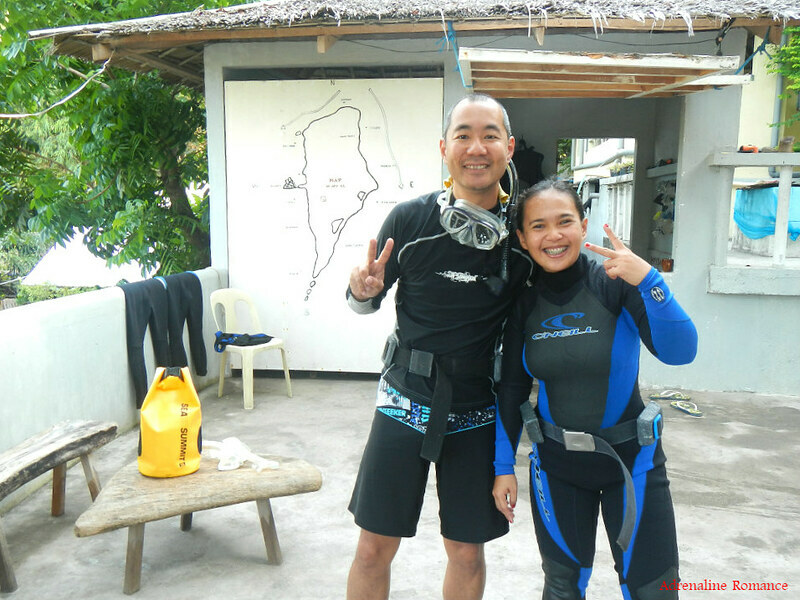 Diving with us is Simeon Pang, a visiting professional diver who just came from Japan. 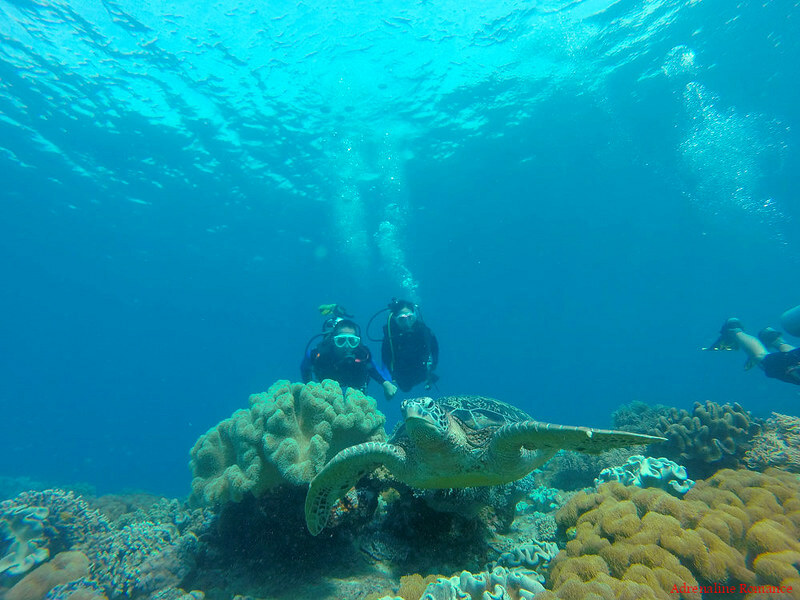 He is excited to check out the magnificent underwater kingdoms that Apo Island is known for. At 7:45 AM, we boarded a small pump boat and headed to the Chapel, which was just a minute away from the shore. Yes, literally a minute! You might wonder why this dive site is called Chapel. Well, it’s really simple—it is just across the town’s chapel! Just check out that clear aquamarine water; you can clearly see a part of the vast coral field under the water. There were no pretenses; we were immediately treated to an exceptionally clear view of a vast coral reef as soon as we submerged. 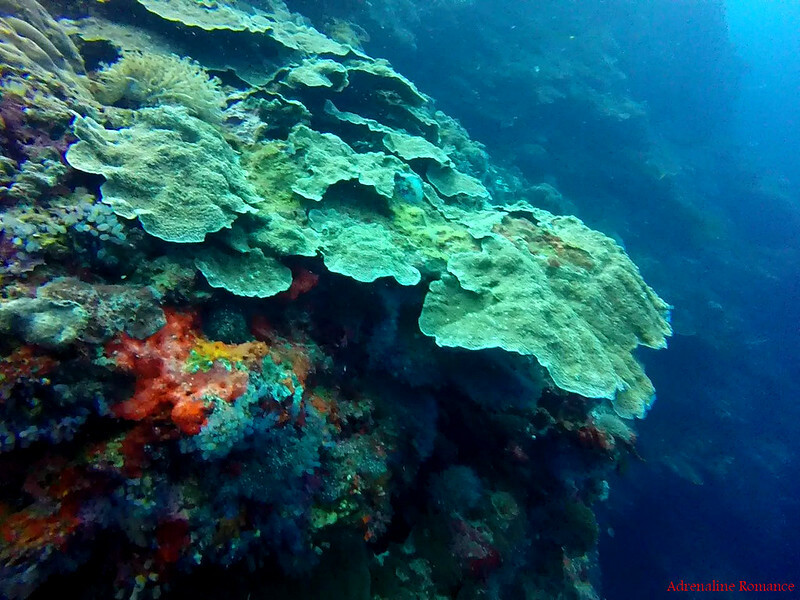 The photo below is just a small section of the reef, but you can see that it is definitely teeming with vibrant marine life. Check out this column and the surrounding corals. This is actually a natural gateway to a deep sea wall. We didn’t know it was a gateway; it was almost imperceptible. Without any hint, we were suddenly cruising along a gigantic cliff that goes down hundreds of feet deep. The rock wall is lined entirely with a huge variety of corals. 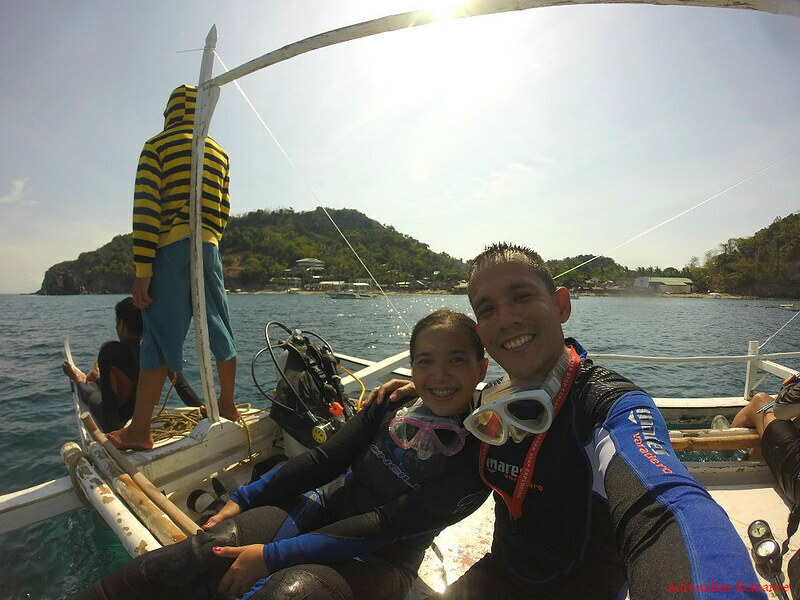 We leveled off at 60 feet, the maximum limit indicated in our PADI Open Water Diver certificate. Expansive elephant ear corals such as these are plentiful. They serve as shelters for fish and other marine organisms. Simeon seemed to be having a really good time. Later, during breakfast, he remarked that this was a perfect dive due to the ideal conditions—warm water, excellent visibility, no current to contend with, and beautiful seascapes. We wholeheartedly agree with him. Colorful corals, glittering anemones, and rock-encrusted barnacles splash vibrancy and tones in the darkness. We think resident fish and marine organisms have a very nice playground. Mac-mac took us to a small, dark underwater cavern where we rested for awhile. In the underwater twilight and surrounded by fellow inhabitants we share with this world, we found solitude. 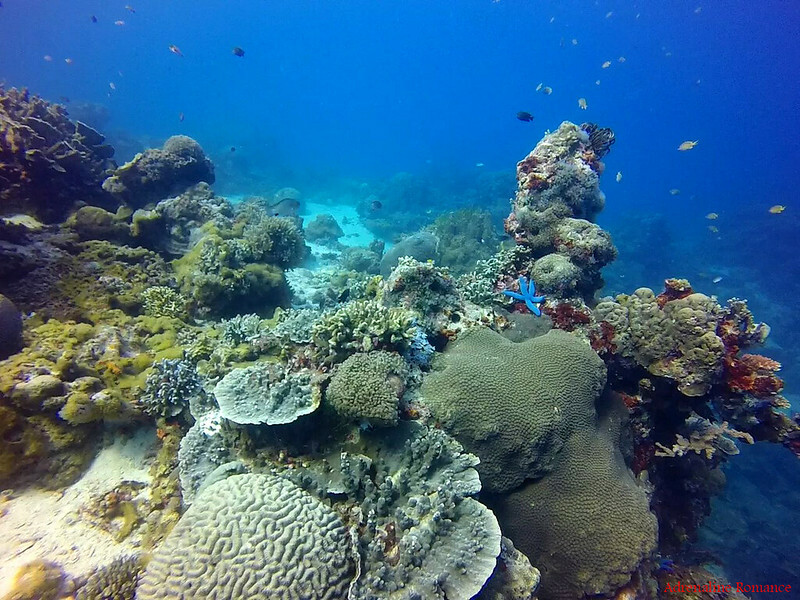 Apo Island is surrounded by marine habitats, each with each own set of characteristics. This is one of the things that draw divers to this beautiful paradise. The entire cadre of habitats form one huge marine reserve that is legally protected by the National Integrated Protected Area Act (NIPA). The entire marine sanctuary is under the jurisdiction of the Protected Area Management Board (PAMB). As we moved to a shallower depth, we simply gasped in astonishment. 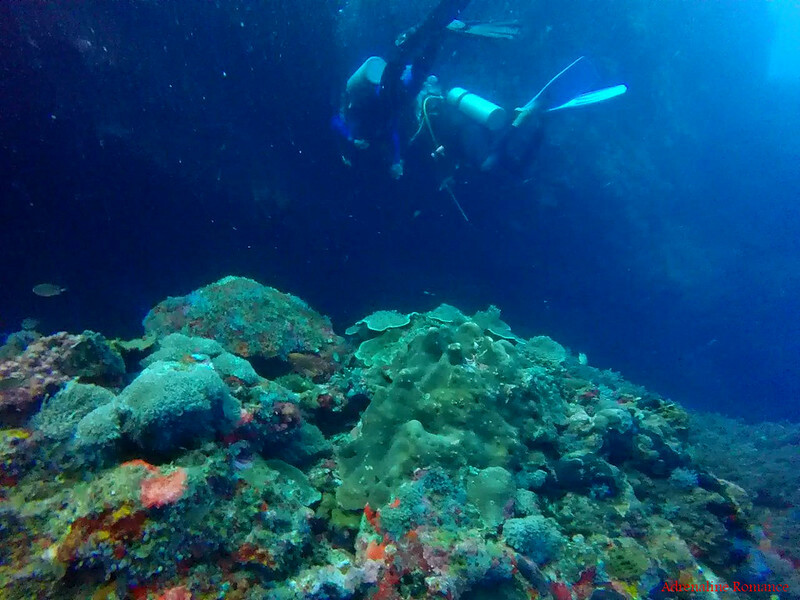 We came to one of Chapel’s highlights, an immense coral field that is easily the size of a barangay! And just imagine, no two corals are exactly alike here! What a wondrous creation! This one looks like a creepy, bleached tree. Is this a coral? Or something else? Just check out that huge patch of staghorn corals. 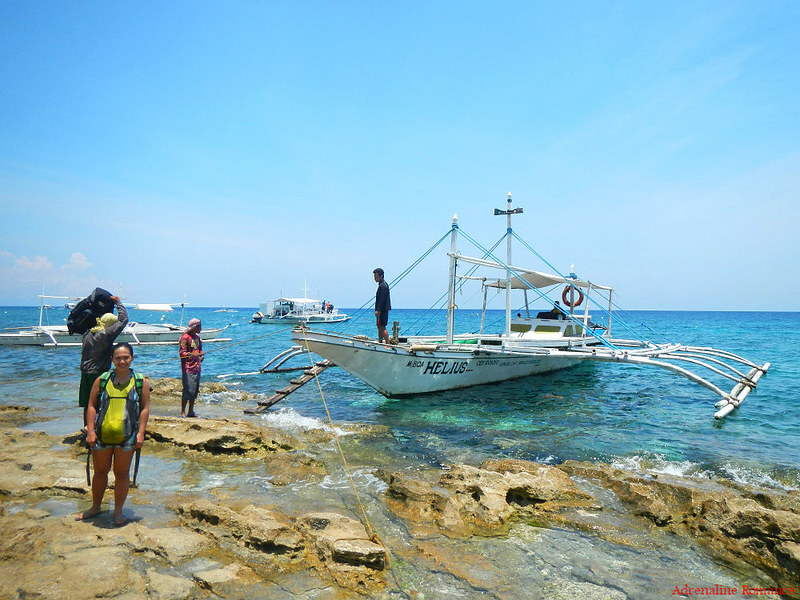 Presently, most of the 450 species of corals in the Philippines can be found in Apo Island. Bubble corals, brain corals, sea fans, and more are all here. 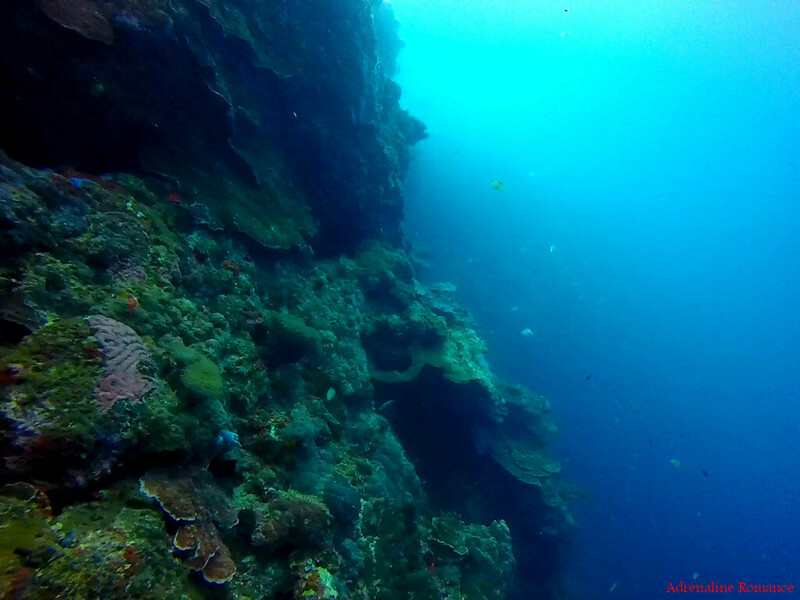 The entire area is so full of live, healthy corals that we can’t see the rock and sand underneath them! 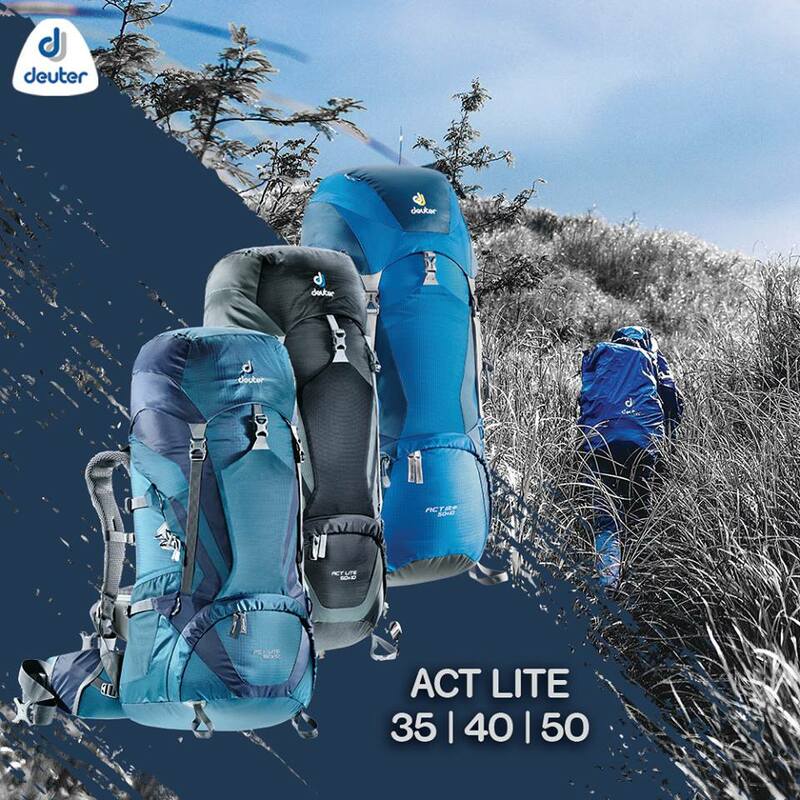 Divers should control their buoyancy since there’s no sandy patch to stand or step on. Where there are plenty of corals, there are also plenty of fish. 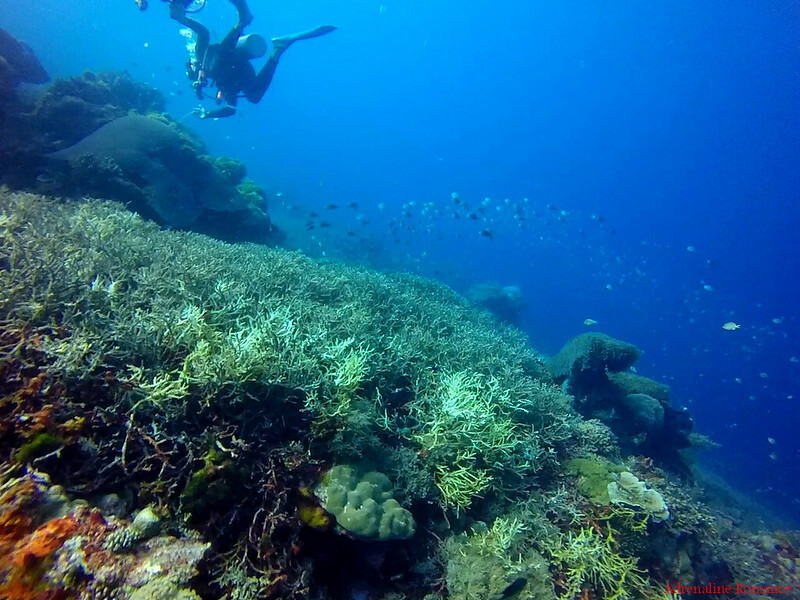 Apo Island is home to over 650 documented species of fish. There were so many schools of fish in the Chapel dive site that we actually felt out of place in this underwater city. 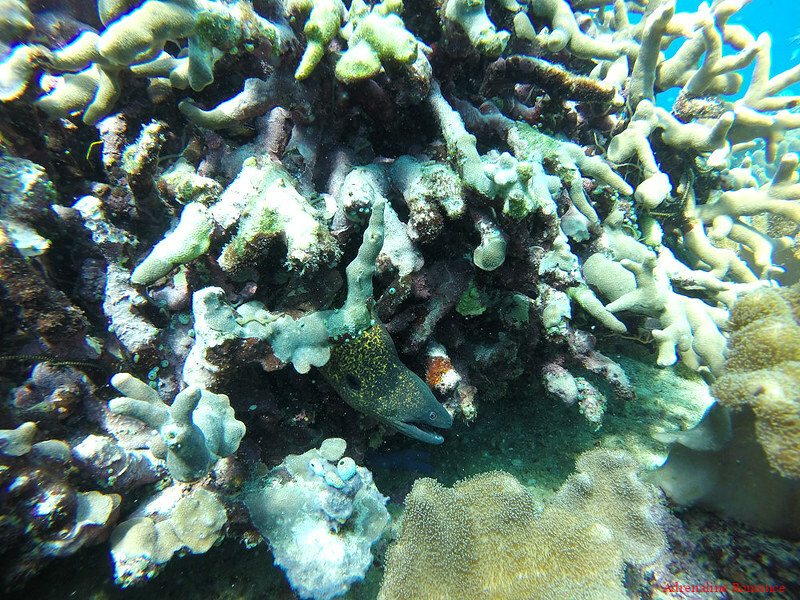 We also found this large moray eel hiding among the corals. Moray eels are shy and reclusive, but they are incredibly vicious when provoked. They say that the best is always saved for last. Well, that held true during our dive. 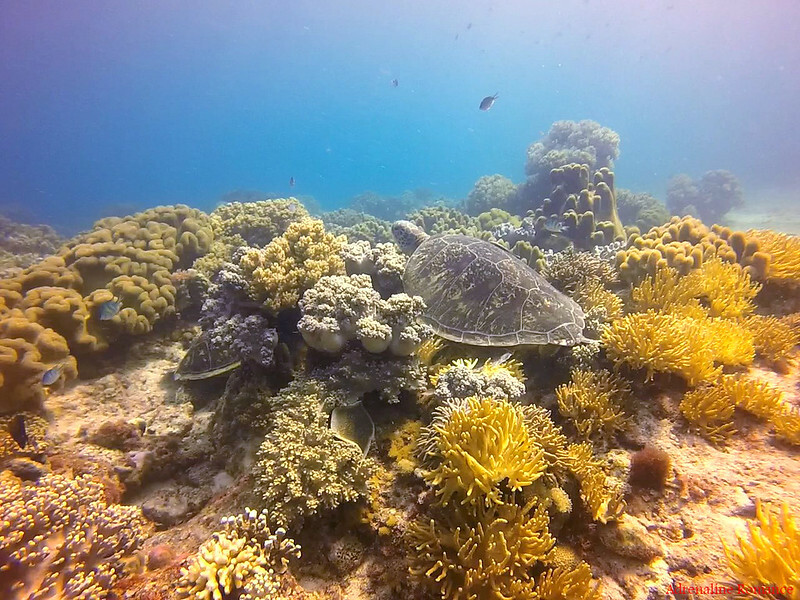 As we approached shallow water near the last section of the Chapel for our required stop, we quickly chanced upon these two gigantic green sea turtles enjoying the morning sun on top of a bunch of soft corals. That’s one of the big guys! Numerous green sea turtles swim freely around here, and they are so beautiful and graceful in the wild. We must have disturbed this guy’s morning nap. As soon as he felt we were uncomfortably close to him, he swam away quickly. Hey, come back, big guy! We won’t hurt you. Unlike the turtles that forage near the shore, these big ones prefer to stay in the deep where it’s more quiet. We have a feeling that the ones that frequent the shore are younger turtles, curious and eager to check out those interesting humans. The older ones prefer to stay away in their own solitude. 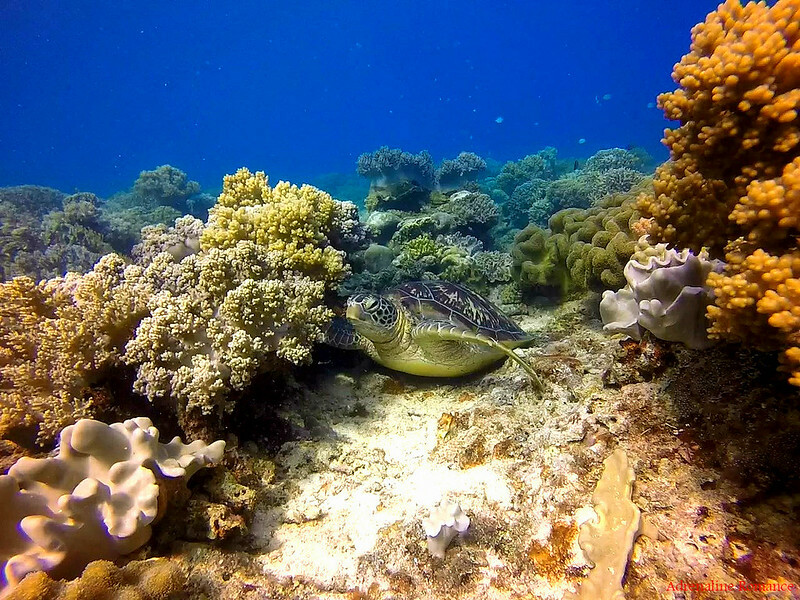 Here’s another green turtle resting comfortably among the soft corals. Isn’t that a lovely seascape? 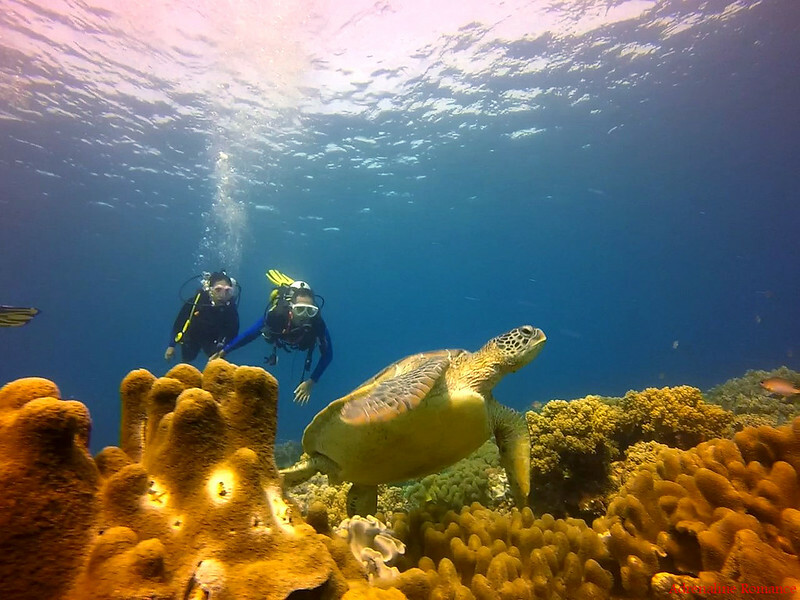 It is as Apo Island is known as one of the world’s best known marine sanctuaries as recognized by the global science community. 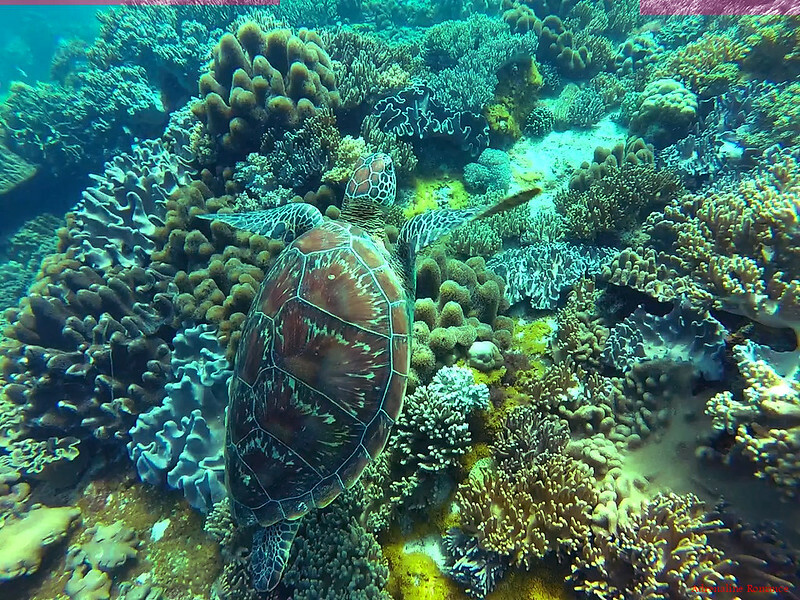 This turtle wanted to go somewhere, but with these four pesky divers in the way, he stopped and shyly hid away under a bunch of corals. 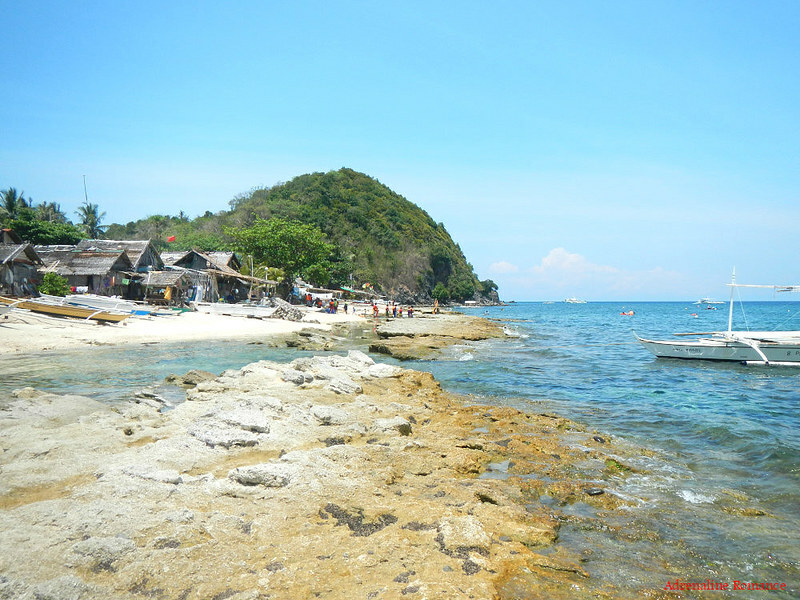 Apo Island was once a fishing ground for fishermen. 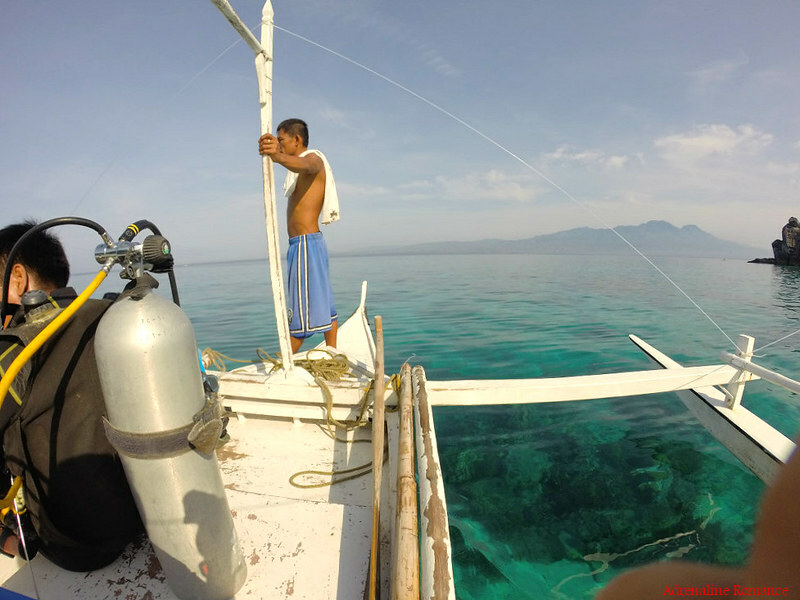 As the fish population was steadily decimated by both legal and illegal means of fishing, Dr. Angel Alcala, a marine scientist from the Siliman University Marine Laboratory spurred to action to save the sanctuary. So, in 1982, he held a dialogue with the local fishermen about the importance of preserving the reefs and establishing a legally protected marine sanctuary around Apo Island. It took Dr. Alcala three long years to finally convince the locals to stop fishing and establish the sanctuary. 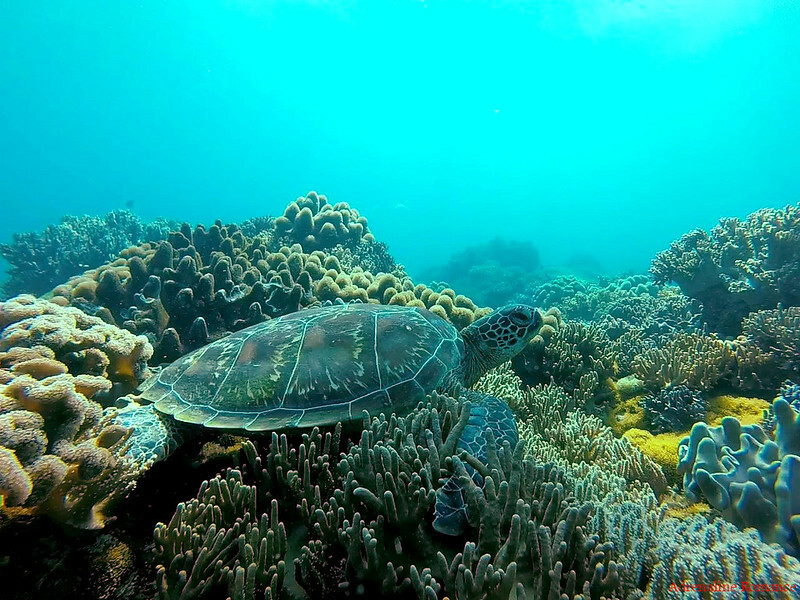 The success of the Apo Island project spurred the creation of similar marine sanctuaries all throughout the country. Vulnerable and endangered species such as this sleeping green turtle can swim and play freely here with no fear of being captured and killed by heartless humans. Turtles eat sea grass, keeping them trimmed, neat, and healthy. We thought the sea turtles near the shore were big. We were wrong! The turtles here in the deep are way larger! In fact, the carapace of that green sea turtle in the photo below is the size of a round dining table that is good for four people! As you can probably tell, we had incredible fun in this dive! Who wouldn’t? Just imagine having the chance to explore one of the best dive sites in the world! Photos alone won’t do justice. 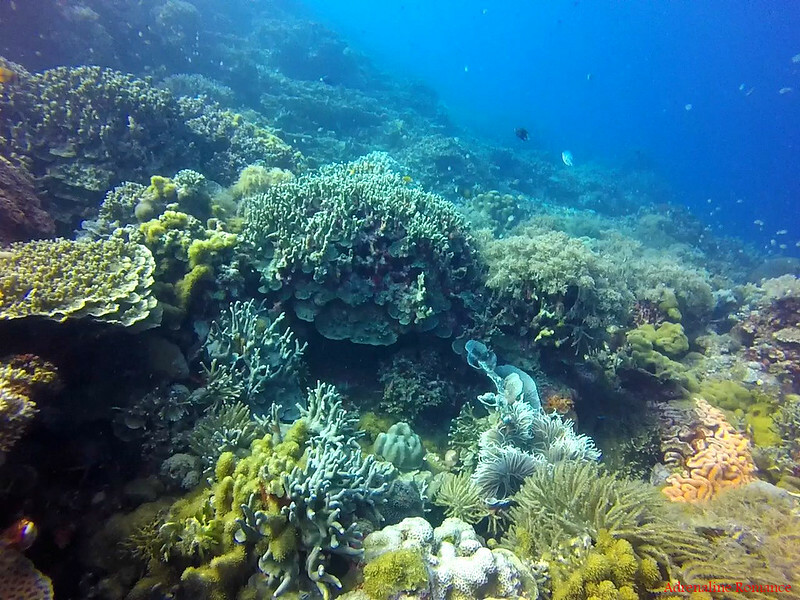 This simple video we did below should give you a glimpse of the exquisiteness of this incredible coral reef. After an hour of exploring the magnificent Chapel dive site, we surfaced and boarded our boat. It’s evident in our faces that we thoroughly enjoyed the dive. All that exertion, excitement, and wonder made us really hungry. Thus, Sweetie, Simeon, and I headed over to our homestay where we voraciously ate a huge breakfast of pasta, eggs, pancakes, and mangoes. Soon enough, it was time to go home. After packing, we went back to the shore to wait for a public boat; we learned from the registration center that one was on its way from the mainland. Check out those large shore-born rocks; these are submerged once the tide goes in. That’s why you need to be careful here when swimming or snorkeling as the waves can push you to these rocks. Half an hour later, the public boat arrived and unloaded water containers, baskets of vegetables, groceries, and other supplies. Once they were reloaded with stuff from the island, we then boarded the boat to head to mainland Negros. 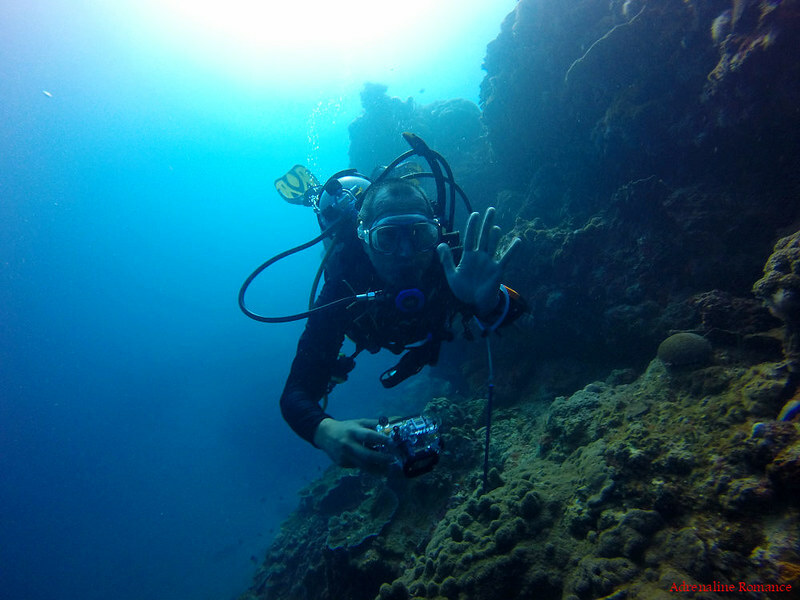 We would like to give special thanks to our Divemaster Mac-mac. He is very friendly and professional, and he ensures that his clients will have a great time. 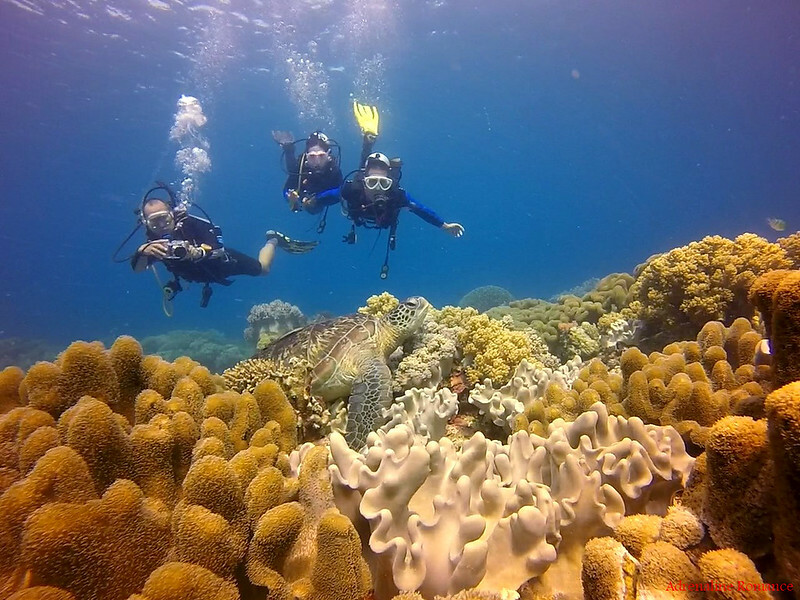 Best of all, he is a licensed PADI underwater photographer and videographer. Thank you too to Mila, the owner of Mario’s where we stayed. She made us feel very much at home. Overall, our anniversary trip to Apo Island is nothing short of amazing. 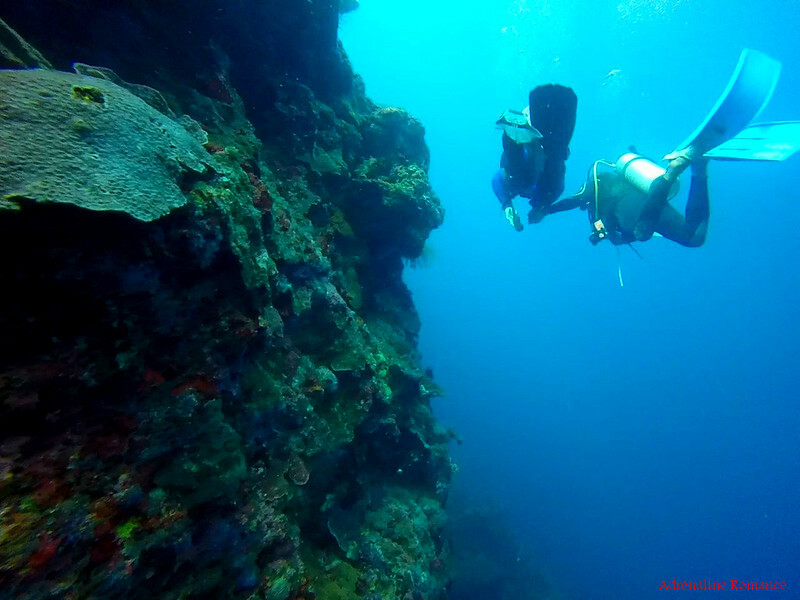 In fact, it was one of the best and most scenic dives we’ve ever had. 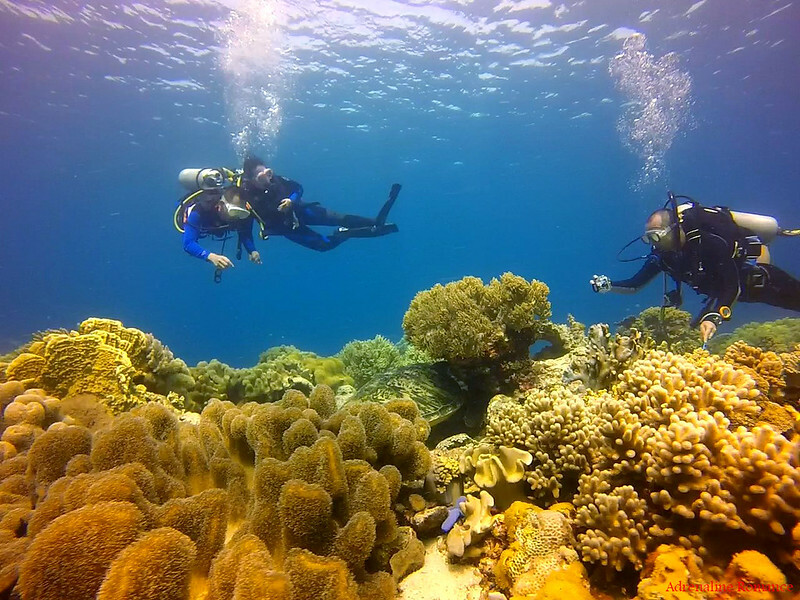 It’s not every day that we get to dive in a world-renowned marine sanctuary. And it’s not every day where one can have a a lovely, adventurous date under the waves. You can bet your last peso that we will be back in Apo Island soon. For other necessary fees mandated by NIPA and PAMB, please check the previous Apo Island post. Other accommodations and providers might offer different rates. 1. For optimum visibility, it is best to dive in the morning when the sun is shining and at the right angle. 2. 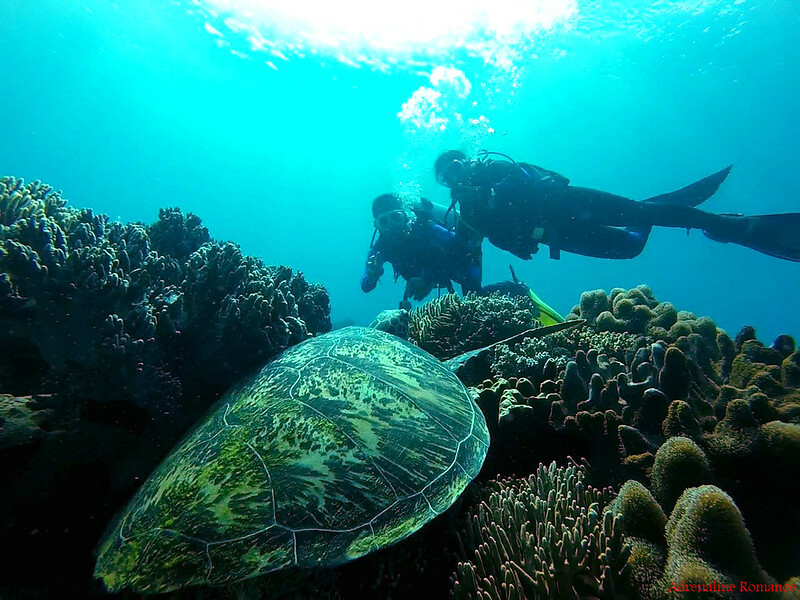 Several dive sites in Apo Island have different conditions and characters. That means, some dive sites require a higher level of scuba diving experience and skill. Be sure to tell your divemaster your skill level. 5. Be a safe and responsible diver. Always observe the Leave No Trace principle. Never touch, disturb, tease, or collect marine wildlife. Remember we are in protected area and an alien world that demands respect. that’s a beautiful place, I love all colours! Indeed it is! 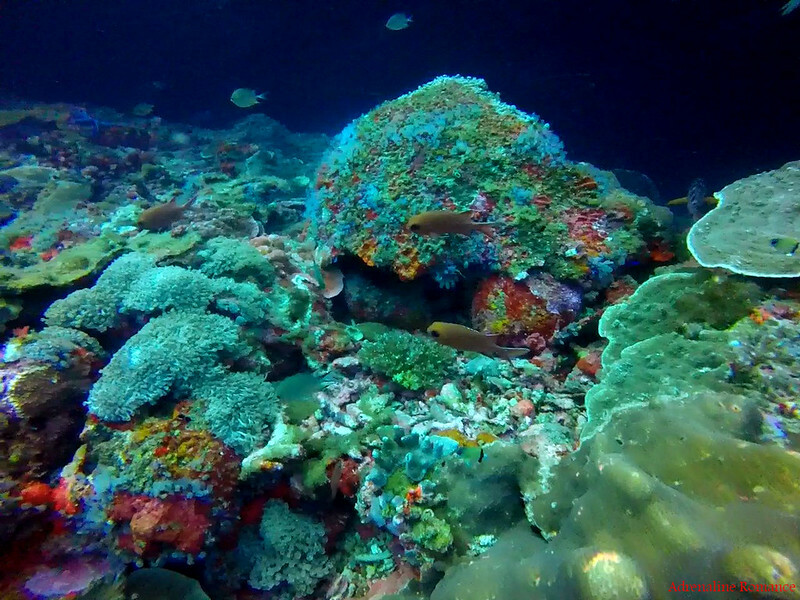 The corals and fish are very vibrant. 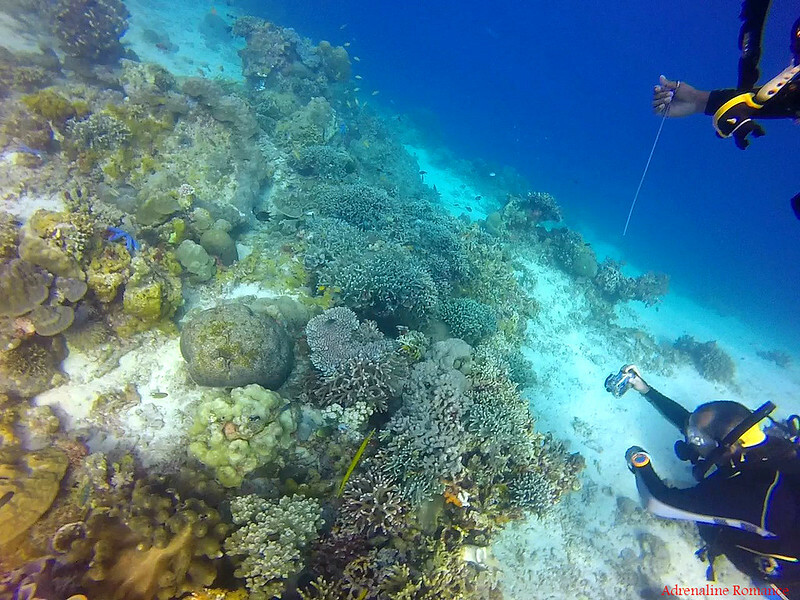 We used a GoPro Hero 3 Plus Silver with red filter for the underwater shots. For the land shots, we used a waterproof Nikon AW100 digicam. Oh, you can! Just tell the divemaster you’ve never scuba dived before, and he’ll take care of the rest. Oh, do you know that Sheila can’t swim either? Hehehe! I’ve been wanting to visit this Island. I must be here by next year. thanks for this great information. Please do, Island Boy! And we strongly recommend scuba diving there. 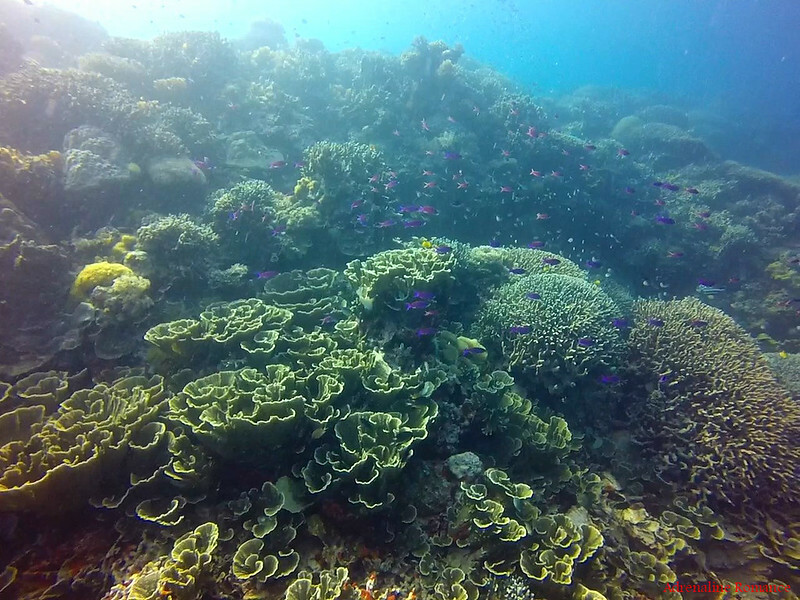 The reefs are beyond awesome! I will! I am sure someday I will return to the Philippines, I also would like to include Palawan on the next trip to the Philippines! Wow, this is beyond amazing. I enjoyed going through the post and all the photos. What a great way to celebrate your anniversary! You guys have the coolest adventures! Thank you for the compliment! 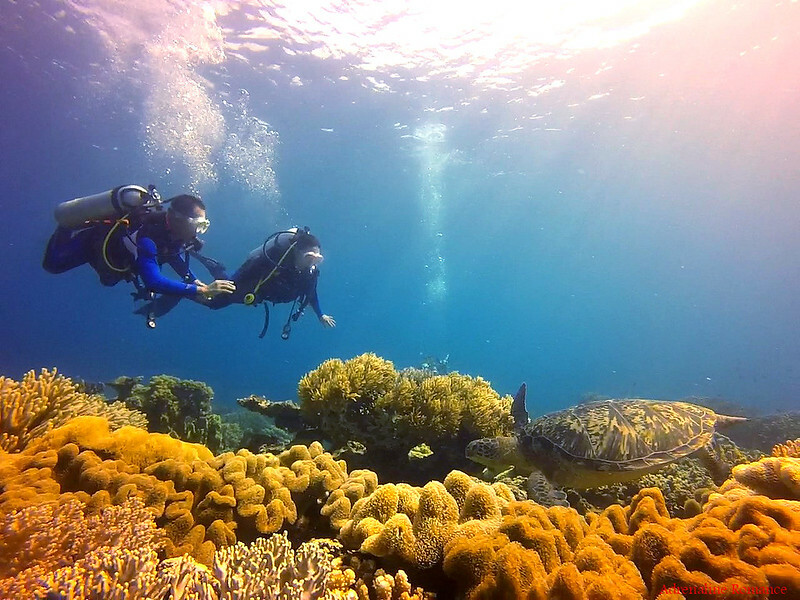 Apo Island is truly a diver’s haven. We plan to come back and explore more of its dive sites; each has its own set of characteristics and features. This is included on my bucket list! Hopefully next year! Beautiful photos! Sige, if the budget permits. I have never done that before, too. Would you know how much is the ongoing rate for that? Don’t worry, just tell the Divemaster that you are availing of DSD (Discover Scuba Diving) since it’s your first time to dive. Your Divemaster will take care of you. The rate for non-licensed divers is in this blog post. Ohh, I see. 2500 for a newbie. okie, noted. Salamat! Yes. In general, the rate for non-licensed divers is always higher than those offered to licensed divers. Thank you! But these photos don’t do justice. You should see the actual reef. It’s amazing! Awesome post! Loved the pix and the video! Ought to visit soon for an unforgettable marine adventure! Your scuba posts are the most inspirational ones I’ve ever read. Every time I see your photos, I kick myself for not learning how to dive when I lived in a town with 4 dive shops across the street. You guys have gorgeous photos, and I’m uber jealous you see so many turtles! They are my favorite. Hopefully one day I’ll experience it for myself, I’m determined to get my certification before we go back to the Philippines! Thank you very much for the compliment, Samantha. Scuba diving is really an enjoyable and relaxing activity. You can actually dive without certification; it’s called DSD (Discover Scuba Diving), although it does have limitations. 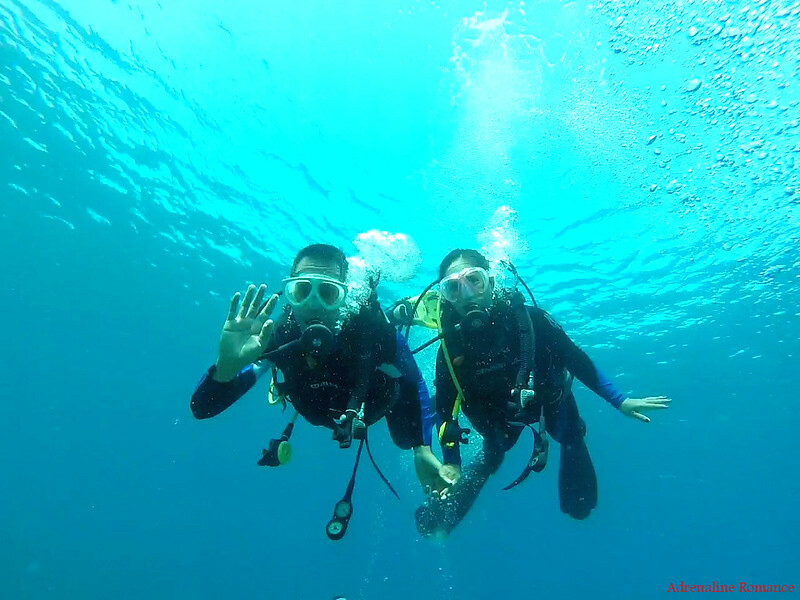 Hope to dive with you soon! Happy new year! Thank you very much for the compliment. 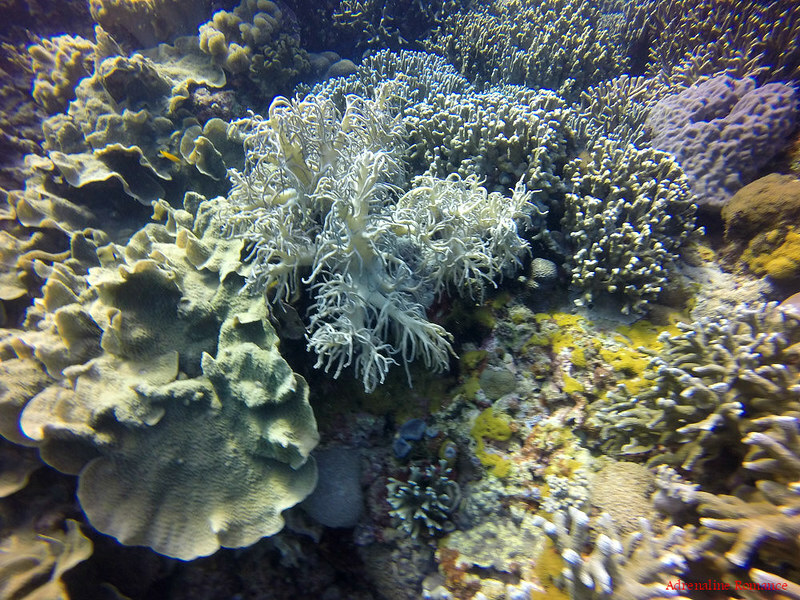 Please do visit Apo Island, and if you have the chance, go scuba diving there. Their dive sites are underwater paradises!